The aviary on Isla Nublar was the home of the Pteranodons of Jurassic Park. It contained the Pteratops lodge, seen only in the concept art of the luncheon scene, which is believed by many to be the entrance to the Jungle River Cruise attraction. It is likely that the design of the aviary is similar to that which is seen on Isla Sorna. Pteranodon, along with Compsognathus, were disputed as the remaining species of the Isla Nublar 15 until they were seen in a mural in the Operations Building in The Lost World: Jurassic Park in an artistic representation of the Park alongside the other inhabitants, and several escaped Pteranodons from the Aviary were seen by Billy Yoder, Oscar Morales, and pilot Danny “D-Caf” Cafaro, mercenaries sent by InGen to extract survivors after the Jurassic Park incident, eventually even taking down their helicopter, knocking out D-Caf and causing the chopper to crash despite Yoder’s best efforts to land it, although the three survived for the time being, only to all die in separate incidents and separate causes later on. Jurassic World, the theme park built on the site of the original Jurassic Park years after the original disaster after a struggling InGen was bought out by Simon Masrani, would also feature an Aviary of its own, though of a strikingly different design than is thought to have been used on Nublar before. Rather than similar to Sorna’s aviary, the Jurassic World Aviary, built in 2004, features a mostly geodesic glass design and a striking pronged metal frame partway up, though the frame does not extend all the way to ground level. A massive structure covering a total of 430,000 square feet, it was advertised on the official Jurassic World site as having safe viewing areas that allow visitors to watch as the ‘world’s only living pterosaurs’ hunt and fly, indicating Masrani Global believes Sorna’s Pteranodons and the escapees from Nublar to all have been hunted down. The aviary featured waters allowing the Pteranodon and the aviary’s smaller inhabitant Dimorphodon, a newly-cloned pterosaur and unique to Jurassic World, ample prey to feed upon. However, the Aviary would not last forever, much like the rest of Jurassic World. It proved to be one of the first park structures to fail during the Asset Containment Unit’s efforts to recapture the Indominus rex, a deadly new hybrid dinosaur that had escaped captivity. After the Indominus wiped out most of the ACU unit sent to recapture it using nonlethal means, including Katashi Hamada, Simon Masrani himself piloted a helicopter armed with a minigun in an attempt to gun down the rogue hybrid and end the threat. Unfortunately, the reinforcing structures not reaching ground level proved to be a critical design flaw, allowing the Indominus to simply smash its way through the geodesic glass construction of the Jurassic World Aviary, where it frightened the pterosaurs with loud roars, inciting several Pteranodons to escape through the hole it had just made, and in their panic, one impaled Masrani’s copilot, causing the helicopter to crash through the Aviary’s roof, allowing the rest of the Aviary’s residents to escape- and killing Simon Masrani instantly. Almost immediately, the frenzied pterosaurs headed straight for Main Street and the oblivious guests of Jurassic World, leaving the now-ruined Jurassic World Aviary behind. Son of Carlos, the Mar Del Plata Captain. 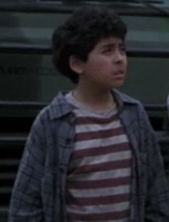 Higo was portrayed by Alex Miranda.